JICE has dispatched a mission to the Emirates Skills National Competition (ESNC) held from April 28 to 30, 2015 as part of a project under “Advanced Human Resources Development Activities in the Emirate of Abu Dhabi, UAE” sponsored by Ministry of Economy, Trade and Industry. This project is pursued based on the collaboration with Abu Dhabi Centre for Technical and Vocational Education and Training (ACTVET), of which aim is to boost training opportunities for young nationals and increase the number of skilled Emirati youths in rewarding career paths and foster life-long learning and self-development. Our mutual goal is to hold a successful "Worldskills Abu Dhabi 2017" by providing training programs so that Japanese experts may transfer their experience, knowledge and skills to the instructors and competitors in the UAE. 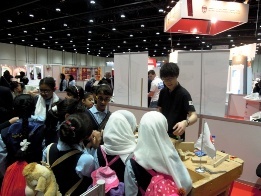 At ESNC, 600 Emirati had registered and competed in wide range of 34 skills categories from craftsmanship to technology field. 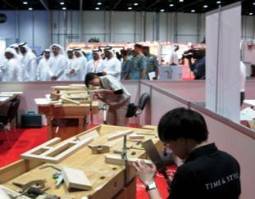 From Japan, skilled instructors of Carpentry, Cabinet Making and Joinery categories participated in the event to support the management and to judge the competition. Japanese national team members of Cabinet Making and Joinery categories who will be competing "Worldskills 2015 Sao Paulo" demonstrated their well trained skills. 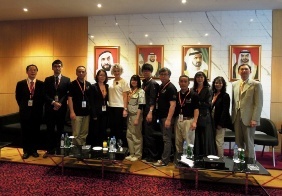 Visitors as well as instructors and competitors of the UAE team seemed deeply inspired by our delegate’s accurate advice and Japanese competitors’ high level of skills. H.H. 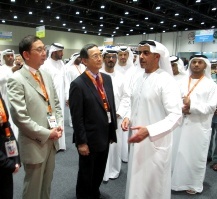 Sheikh Saif bin Zayed Al Nahiyan, Deputy Prime Minister and Minister of Interior paid a visit to the demonstration area of Japanese competitors and extended his kind gratitude for our participation of the national event and the contribution to enhance the tie between Japan and the UAE. 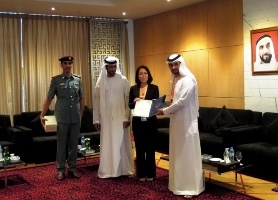 JICE will make the further efforts on collaboration with ACTVET in the field of advanced human resources development.